The afternoon tea service at Steakhouse 55 is not a new offering at the Disneyland Hotel, but is one that I was recently able to enjoy. 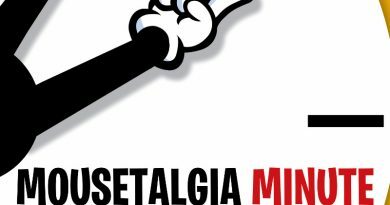 Since its introduction in 2016, this experience has been highly sought after. Available from noon to three pm on Fridays through Sundays, reservations fill up quickly – and for good reason. 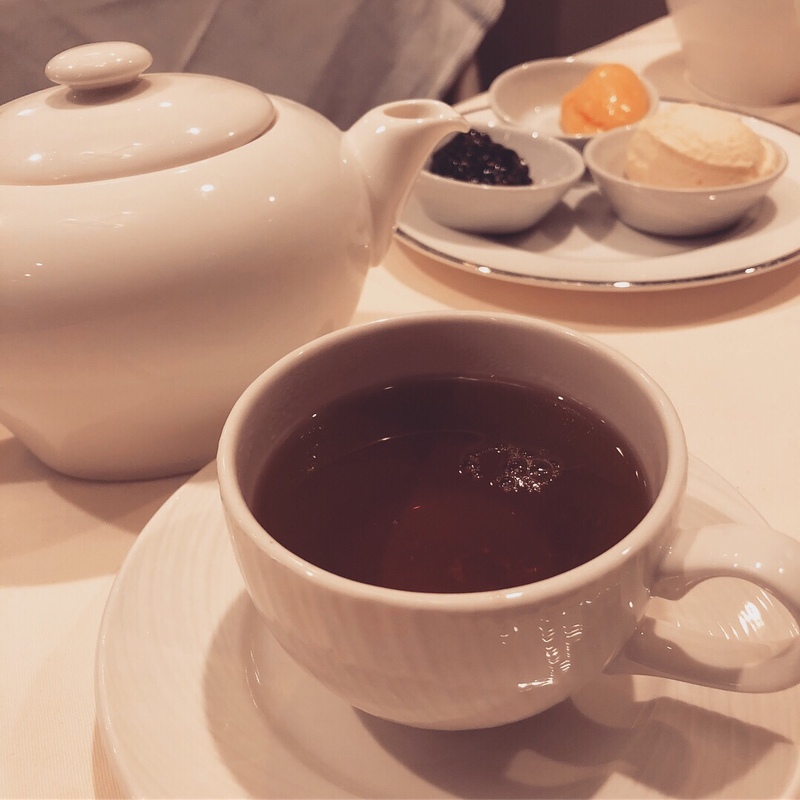 Before I get into the details of what this experience entails, I want to heartily recommend splurging on a lovely afternoon of tea and treats. 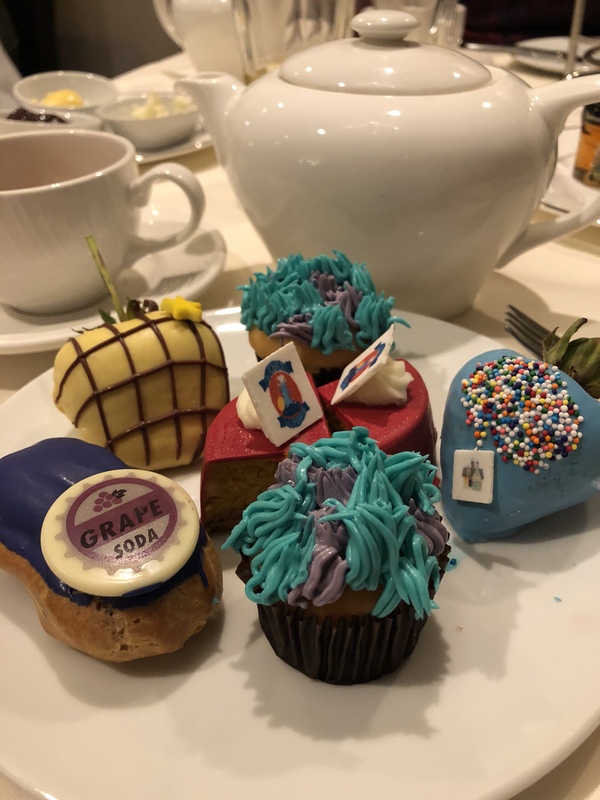 There have been different iterations of the tea party (including a Halloween version that debuted last year), but right now they are keeping in line with Pixar Fest. 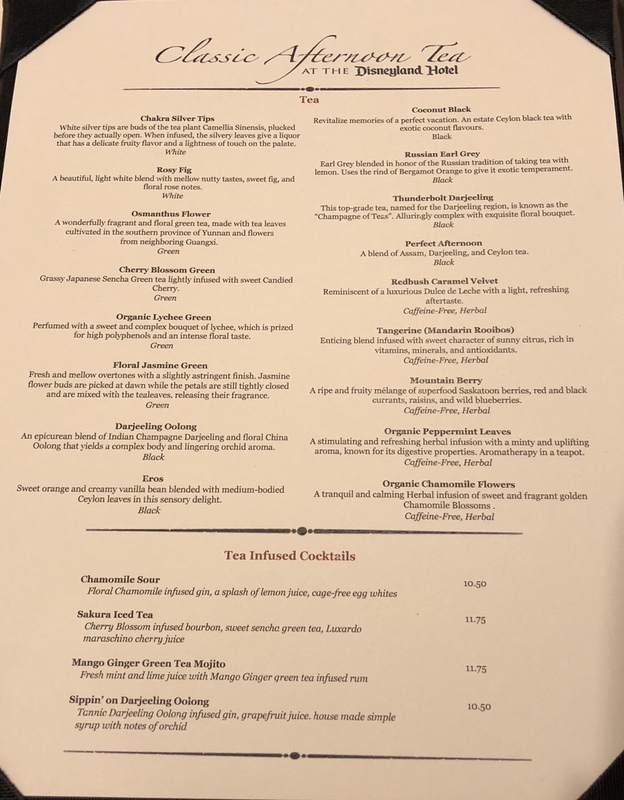 With the exception of the tea options, they have created a menu that highlights some recognizable elements of Pixar films. 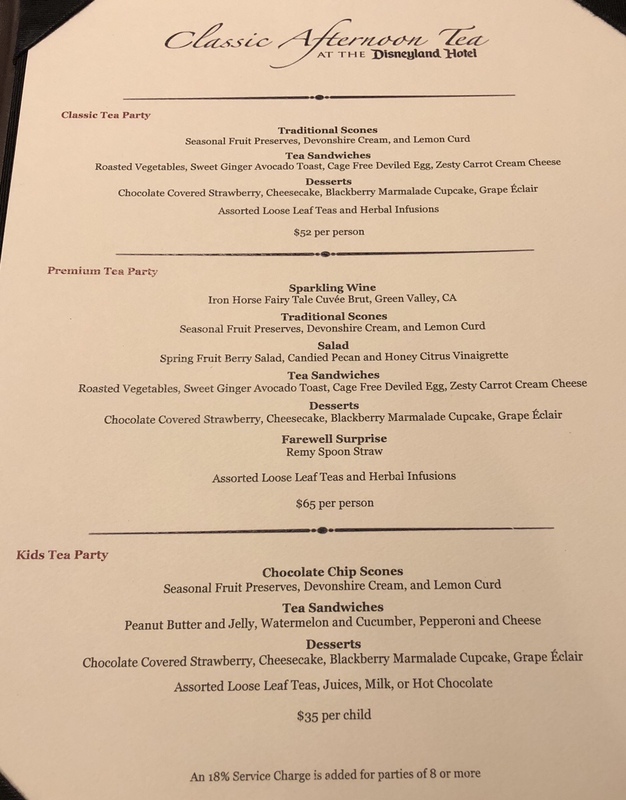 There are two choices you need to make for this dining experience: which type of tea party you want to experience and which flavor tea you want to savor (menu options pictured below). 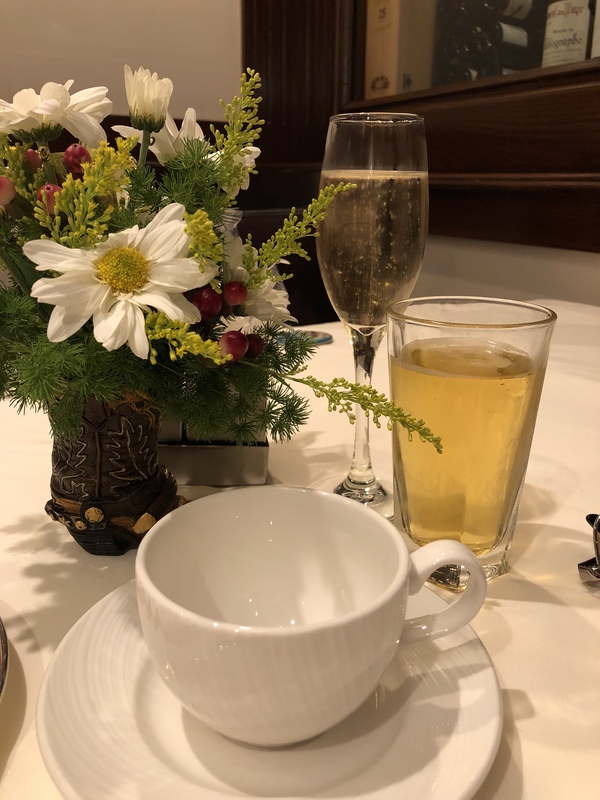 We opted for the premium tea, but were able to customize it slightly for the non-alcohol drinking members of our party with sparkling cider. Don’t stress about which tea to choose because everyone in your party gets their own teapot so you’ll be able to sample a couple different types, assuming you’re willing to share. 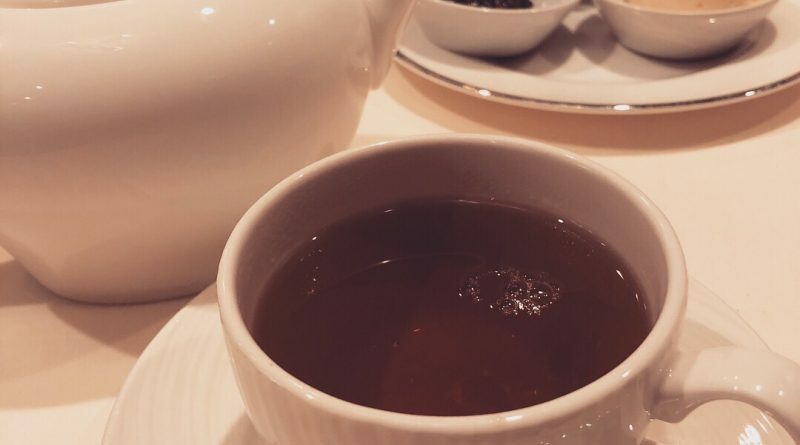 I enjoyed the Redbush Caramel Velvet herbal tea and found it to be smooth and sweet enough without any sugar or cream. Next was the salad that came covered in edible glitter and boba, two things I generally try to avoid, but gave it a try anyway. The boba was cute and reminded me of memory globes from Inside Out. 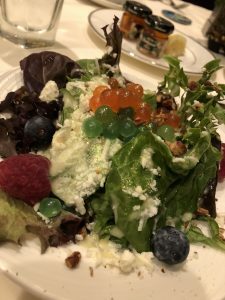 The salad also included fresh fruit and candied pecans with a honey citrus vinaigrette – which made it very refreshing on a hot day in Anaheim. 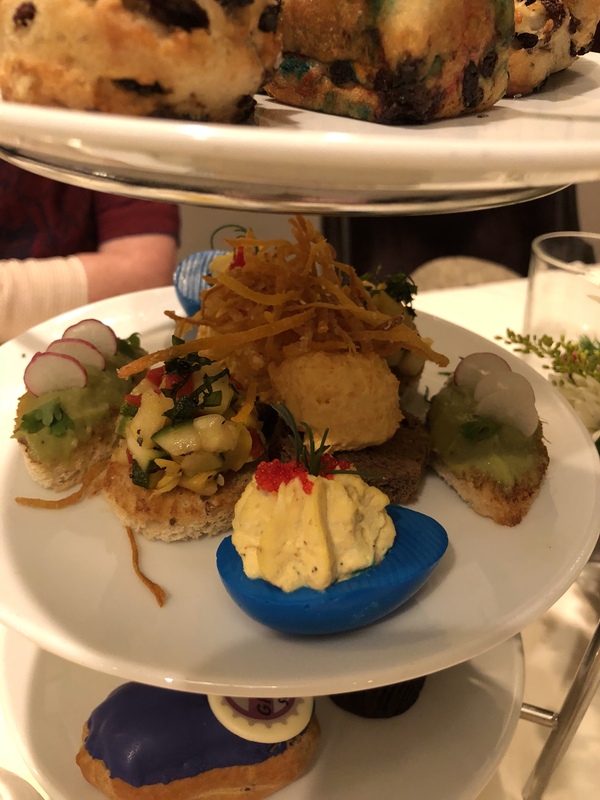 Then came the tea tray that was three levels high and was loaded with lots of fun Pixar elements, with so much detail that you had to stop and look at everything before diving in. 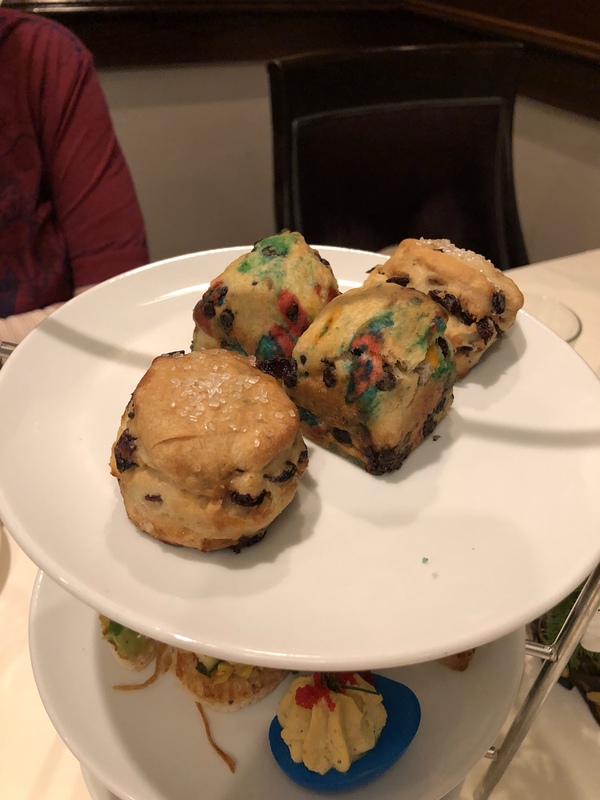 The top level had two different types of scones, both chocolate chip, but one had colorful specks representing abstract thought from Inside Out. The scones were served with three types of spread, but do yourself a favor and just stick to the Devonshire Cream – you will not be disappointed. The second level contained savory tea sandwich-type offerings. There was: avocado toast – shaped to represent the green aliens from Toy Story; deviled egg – in bright blue and yellow to look like Dory from Finding Nemo; roasted vegetables on a cracker – Ratatouille; and my favorite, the carrot cream cheese on a piece of rye bread with fried carrot shavings on top to simulate Merida’s wildly awesome hair in Brave. Now, the desserts. Again, an assortment of goodies that were Pixar related and all finger food. 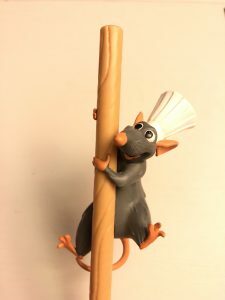 There was: a grape eclair – complete with a grape soda chocolate badge; cheesecake bite – with Remy from Ratatouille on a piece of chocolate; blackberry marmalade cupcake – the frosting was colored and textured to look like Sully’s fur from Monster’s Inc.; and a beautiful chocolate covered strawberry – one was made to look like Woody from Toy Story and the other looked like the Up house flying high in the sky with little multicolored sprinkles that looked like balloons. Upon checking in for our reservation, the hostess asked if we were celebrating anything. We told her it was my mom’s birthday and at the end of our time, our waiter brought out a Mickey Mouse chocolate birthday cake for her, complete with a candle to blow out. We needed to wrap that up though because we were all on the path toward stomach aches from all the sugary goodness. Our parting gift for choosing the premium tea party was a plastic Remy spoon straw. We had a fantastic time at the afternoon tea and are looking forward to doing it again in the future. It was a great way to slow down and get out of the heat. The ambiance of Steakhouse 55 is fantastic and the wait service was great – very attentive and helpful. 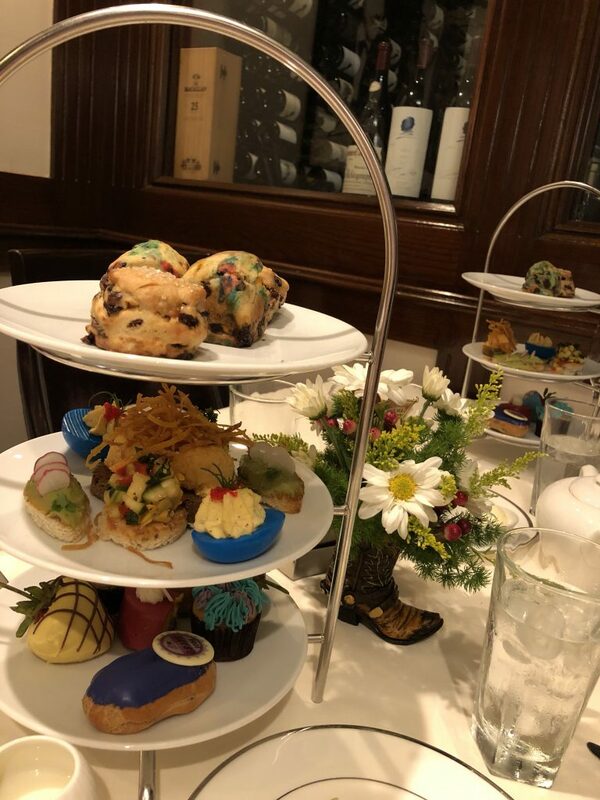 The afternoon tea is also a great opportunity for those fellow humans who don’t love eating copious amounts of meat to be able to enjoy the restaurant. While it’s not a full meal, there was enough food to be comfortably full until dinner. If you’ve been considering trying this option, don’t wait – just make a reservation for your next trip. Enjoy your tea and Carpe Kingdom!